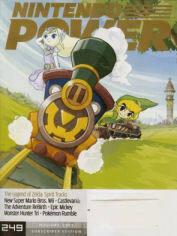 Nintendo Power’s 2009 award winners have been revealed and Spirit Tracks was able to take home two prizes. Spirit Tracks won the award for DS Game of the Year and also won the award for Best Adventure Game. Additionally, Nintendo Power put together their Best of the Decade list. In terms of primarily single player Zelda titles, we’ve gotten 8 Zelda titles this decade. While I don’t think that the top two were Twilight Princess and the Wind Waker, it was nice to see two Zelda titles make the list. Check out GoNintendo for some more awards.